You can get purple carrots and spuds. Purple doesn't happen until they are about eight. Have you bought seeds from these people? I haven't come across them before. What about edible pink flowers? 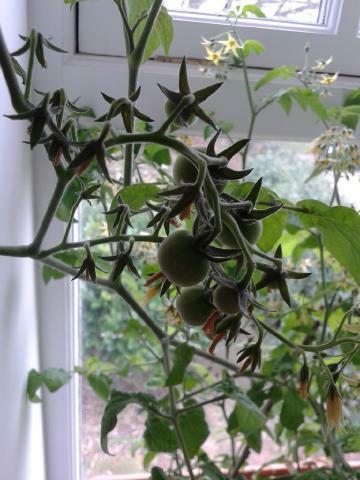 No, wait, that's a lie, I did throw in some tiny tom tomato seeds to grow indoors over winter, they are doing very well considering. Purple is second best (because it's my favourite). I forgot about spuds - we have pink fir apple chitting. Rhubarb is in already. I'd completely forgotten about chard. I'll get some rainbow carrots and I was considering rainbow aramanth - is that the same as orach? I hopefully have a pink blueberry on the way. Nasturtiums do. Can you get pink ones? How did you manage to keep tomatoes going in the winter Northern Monkey Girl ? They're on my bedroom windowsill. South facing, painted white all around. They went a bit leggy, are supposed to only be 12-18 inches max, and didn't really do much until maybe Jan/Feb?